Happy 2nd Blogiversary To Meeee! This month marks 2 years since I started blogging. Happy 2nd blogiversary to me! I started off on blogger, writing about my competition wins, books I loved to read and gardening tips. I didn’t know what self-hosted meant, I didn’t have a clue about DA, follow links, linky’s, coding and so many other terms it would take me an age to list! I wasn’t a part of any Facebook blogger groups, and honestly didn’t know you could make money from blogging. I was in my own little bubble, drifting along doing what I wanted to do – sharing bits and bobs of my life and the things I loved. As time went on I started linking up to a couple of linky’s. My first ones were Brilliant Blog Posts by Honest Mum and #MySundayPhoto by Photalife. I then realised that there was a whole new world out there! I discovered some fantastic blogs – The Reading Residence, What the Redhead Said (although that one was called something else at the time) and of course Honest Mum to name a few. These wonderful blogs gave me the inspiration to do what I’m doing today. I’m so glad I had those first few months rolling along learning titbits without any pressure that seems to be rife nowadays in the blogging world. I don’t want to seem mean but new blogs are started up everyday by people wanting 100’s of page views immediately and needing money quick sharp. It doesn’t happen like that. I got my first sponsored post 13 months in. It takes time to build up your DA, for PR’s to come knocking on your inbox. It takes time to build up your audience. Trust me I’m still building up my readers and it’s not an easy job! I’m in love with blogging. Two years down the line and my blog has turned into a kind of mis-mash of parenting, books, lifestyle topics and who knows what else! I’m not your typical mummy blogger. In fact I rarely post photos of my daughter. It’s personal choice but I don’t feel it’s right to post photos of her all over the internet. I went back to work in October last year after 10 months off on maternity leave. While I was off I went blogging mad and built my blog up to what it is today! Now I get home from work each day, sort out tea and bedtime then I’m straight on the laptop blogging away for a few hours before I get dragged off to bed for my 4:45am wake up alarm. I do this because I’m in love with blogging. I have been brought up with the values that if you do something it has to be done good. Why bother with a half-hearted attempt? So there you have it, my quick version of my 2 year blogging journey. When I do have the time I plan to write-up my blogging journey and the tips I have learned along the way. But that’s for another day. To celebrate my 2nd blogiversary I have a lovely giveaway for you. You have the chance to win a fantastic journal. It’s called The Morning Sidekick Journal and takes you on a step by step journey to conquer your mornings and therefore conquer your life. It’s just the perfect thing for me at the moment to help me organise and prioritise my life. Happy blogiversary lovely 🙂 Mine turned two in January and I have no idea where the last 2 years have gone! Well done on all you’ve achieved so far and I’m in awe of you balancing so much. So lovely to read what you do and why you do it. I’m glad I’m not the only one who’s blog is a bit of a mish mash. I call myself parenting/lifestyle but I’d prefer there to be a category called “whatever takes my fancy” lol. Keep doing why you are doing. And yes I hate the “I’ve been blogging 5 minutes why aren’t I huge and successful types”. I’m also very jealous of the “I have been blogging 5 minutes and I’m very huge and successful types” lol. Wow, a great milestone. You should be very proud of what you’ve achieved! 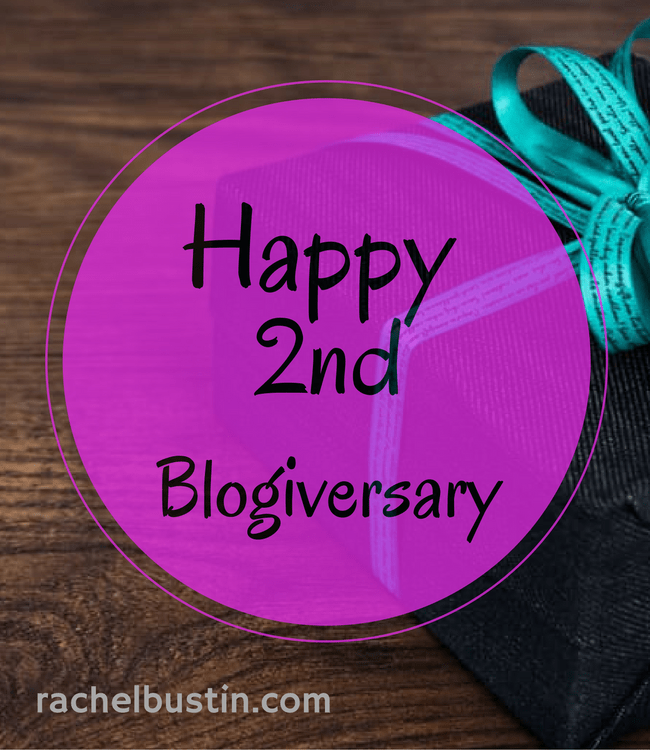 Happy 2 years of blogging, Rachel! I hope there will be many more. You’ve achieved a lot, you should be proud. The journal looks like it’d be ideal for me. My mornings on a Tuesday, Wednesday and Thursday are the most ‘hectic’, as all three of us have to be up, fed, dressed and ready in the car by 7.30am to go to school, daycare and work.